Inside: Updated 3/4/2019 Do you feel like you are struggling to make ends meet as a single mom? 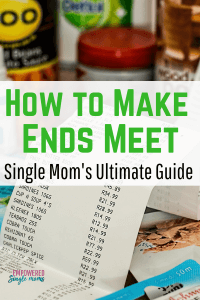 These frugal living tips are just the guide you have been looking for to make ends meet as a single mom. 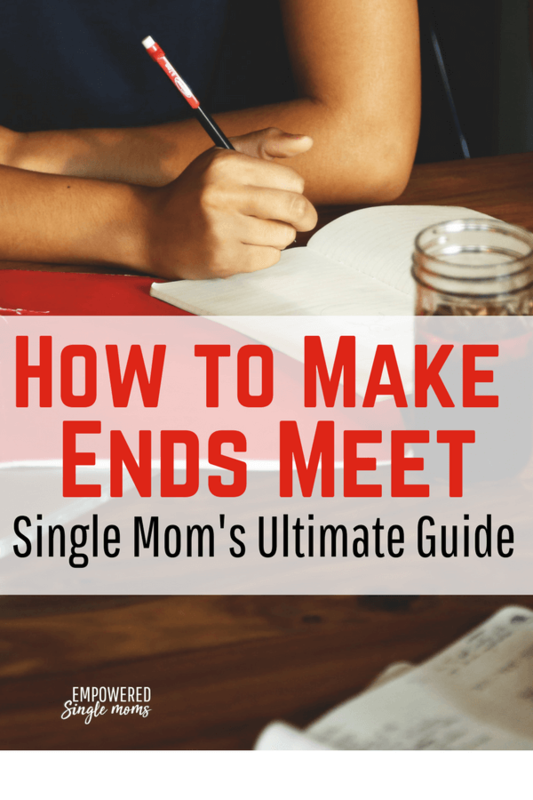 When you’re a single mother, making ends meet may seem like the equivalent of climbing Mt. Everest or running an ultramarathon. People have done it, but how to do it may seem like a superhuman task. You are not alone. More than half—52%—of Americans are struggling to make ends meet, according to a new report from the FINRA Investor Education Foundation. This post may contain affiliate links, so if you buy a suggested product I will earn a small commission. We are a participant in the Amazon Services LLC Associates Program, an affiliate advertising program designed to provide a means for us to earn fees by linking to Amazon.com and affiliated sites. Read the full . Rest assured, other moms have done it and so can you. At first you may be struggling to make ends meet, but it will get better. I know this from experience. In the middle of my divorce, I lost my job. I made it through that crisis and no matter what your circumstances are, you can make it too. Focus on how you will make ends meet, not if you will make ends meet. Your only other choice is to give up, but you have children to take care of, so that giving up is not really an option. You are strong and you will do this. It will not be easy at first, but once you have a plan, everything else will fall into place. 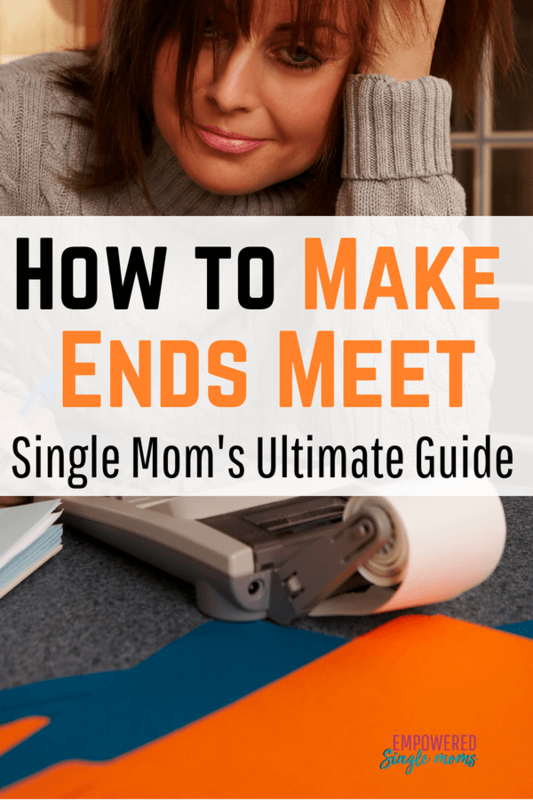 Let me show you the three-step process for making ends meet. Mindset is the most important of the frugal living tips. It is a financially successful single mom’s most important asset. First of all, you need to believe you can make ends meet. It is not a question of if you can do this it is a question of how you are going to do this. When obstacles arise, and they will, ask yourself, “What do I do next?” and “What is the solution to this challenge?” Remember this and you will find a way. Stay focused on your goal. This book and this book offer great ideas for staying focused within the correct mindset. You will make mistakes along the way. These are learning experiences. Learning is part of any journey, and that is what you are on. Pick yourself up and keep on going. Going from two incomes to one means you will need to cut your expenses, but frugal living does not need to be sad or depressing. Most people already have more stuff than they need. The most important step to living frugally is to make a budget and stick to it. Here is a great class that helps you make this happen one step at a time. 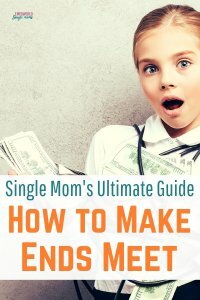 I tell you more about the class and one of my favorite books on spending less in Single Mom Budget Your Way to an Amazing Life. If you make a plan, you will not always need be as restrictive with your spending, but for now, cut your expenses. How to Save Money Every Month gives you the resources you need to cut your expenses and live within your means. Liberty Health Share Review: Is it for You? Check out this review if you are sick of the high cost of health insurance. This is a great alternative to health insurance for some. Try Ebates you can earn cash back when you shop online. Use this Ebates referral link and get a $10 credit to start. If you add the browser extension it is super easy. One great way to cut expenses is to plan your meals. Dining On A Dime is a fantastic resource for frugal meal planning. Do You Know How to Have a Fun and Cheap Single Parent Holiday? To make your life easier, access to my resource library including the 5 steps to financial independence on a handy printable. Living frugally is important; however, while you create a life you love, you must maximize your earnings. No amount of penny-pinching will give you financial security if you are not earning money. Some moms look at their income as something that pays for the extras, but not the bread and butter of life. That is no longer your reality. Now you are the breadwinner of your family. Evaluate your earnings. Do you need to put in more hours at your current job? Will you need to look for something that pays more or offers more hours and benefits? Yes, changing your employment is yet another big life change, but it may be crucial to your success. It’s better to start considering your earnings right away rather than waiting until you find yourself in dire need. You may be getting child support or spousal maintenance, but it is a mistake to depend on these sources of income. According to this article, 39% of dads do not even pay the full amount of child support. I don’t mention this to vilify fathers. Often, there is a legitimate reason such as a job layoff or injury that causes dads fail to pay child support. Simply, depending on another person to support you is not a good plan–especially when you and that other person do not even like each other. I have mixed feelings about whether or not to pursue child support and spousal maintenance. There are different, valid arguments for both sides. I believe that spousal maintenance is an outdated idea from when women had far fewer earning options than they do now. I also know that depending on your ex to support you will likely breed resentment and make amicable co-parenting more difficult. Regardless, figuring out how to support yourself and your family will make you feel stronger and more confident, which can do wonders for all aspects of your life. Consider that spousal maintenance is usually short-term, and your children will eventually be 18 and you will no longer receive that support. At a minimum, you need a financial plan to provide the life you want to live when your children grow up and move out. For further reading on the topic, this author takes a bold stand against child support and spousal maintenance. Cut expenses to give yourself breathing room and reduce stress. Earn the money you need. It will increase your confidence, reduce stress, and allow you to be more independent. Everyone who successfully climbs Mt. Everest or completes an ultramarathon has self-confidence and a plan for reaching their goal. Every great feat is a collection of steps. Your new, financially independent, and joyful life is already underway. Follow your plan. Before long, you will reach the summit and enjoy the view.